The Lincoln Stars will look to snap out of their current six game losing streak when they travel north on I-29 to North Dakota for a weekend series tilt against the Fargo Force. The Stars are still licking their wounds after they wrapped up an eight game home stand with a record of 1-5-2, while being outscored 31-15. With only 9 games remaining in the regular season, the Stars still find themselves in last place in the USHL West Division with a record of 13-30-8 (34 points). The Friday night game will begin at 7:35pm, while the Saturday night game starts at 7:05pm. 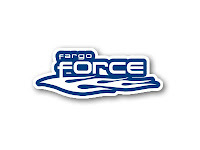 Head Coach Steve Johnson and his Fargo Force currently sit in second place in the USHL West Division with a record of 33-13-4 (70 points), only 4 points behind the Omaha Lancers. With 10 regular season games remaining on their schedule, the Force are right in the thick of a divisional championship race with the Omaha Lancers. The Force and the Stars have faced each other two times this season, with Fargo winning both contests. On 10/2/09, the Stars opened the 2009-'10 regular season with a loss when the Force beat the Stars 5-2. In their second matchup on 1/30/10, the Stars played very well at home but lost a nail-biter to Force by a score of 2-1. The Force have a home record of 17-7-2, while the Stars sport a 7-14-4 away record. The Stars have not won the road game since beating Tri-City 6-2 on 1/20/09. Like the Waterloo Blackhawks whom the Stars lost to this past Tuesday, the Force field a very deep, fast team. The Force are led by four forwards who have scored more than 45 points this season: Corey Leivermann (52 points), Matt Leitner (50 points), Nate Condon (49 points) and Chase Grant (46 points). The six top point getters for the Force are forwards, so this is a team with enough depth up front to score a lot of goals. The Force, like the Stars, are a team that does not shy away from physical play. The Stars lead the USHL in penalty minutes with 1496, while the Force aren't too far behind in third place with 1225. The Force have already clinched a playoff spot this season, but what the Force are really driving for is that top position in the USHL West Division. Will the Force overlook the Stars? Can the Stars rebound from their disastrous eight game home stretch? Will Steve Johnson remain undefeated against the team he coached for 10 seasons? Note: Rumors abound that Stars forward Brodie Reid is no longer on the team. The particulars about his absence hasn't been officially reported by anyone in the media, nor has the move been noted on Pointstreak. Reid was in street clothes this past Tuesday night for the Stars game against Waterloo, with most thinking he was sitting due to the USHL sanctioned 5 game suspension he was given for his role in a last-minute line brawl against the Chicago Steel on 3/5/10. We will be blogging live for both games this weekend, so I hope to see a good turnout from all the Stars fans out there. The more, the merrier. I will post the chat article sometime during the day on Friday. Keep an eye out for that. Any of the blog readers heading up to Fargo for the games this weekend? I will be there :). I might have to check out your blog as I also will be blogging live from the game (more of a play-by-play than a chat). Bring some people up, the crowd will probably (but hopefully not) be sparse with Bon Jovi and Sioux Gophers in the area... We'll take all the butts in the seats we can get! Good luck...we need these four points! of course the fargo guy will be there!!! i hope that we get alot of "fans" following along here doing the blog thing! i have to say that the poll question is somewhat biased as who would post they dont like their seats? unless there are people around you that are rude and get obnoxious. i think i have about the 2nd best seats in the ice box, as i am next to the visitors announcer booth. why else would they give them this place as it is the best place to watch the games?? when you answer this poll, you should have to post a reason why you like your seats...?? ?